We're celebrating our 30th Anniversary, and what better way to do it than by opening a new store? It's been months in the making and now the day's finally here: the 9th Evelyn & Arthur location opened yesterday in The Villages, Florida! 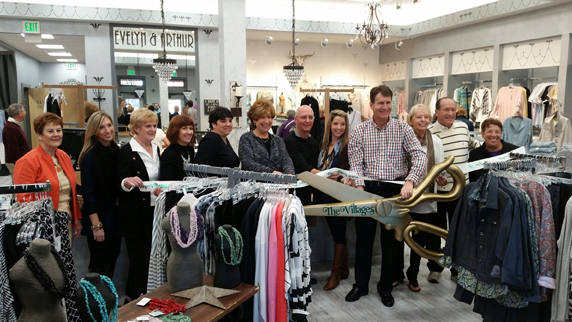 The day started with a ribbon cutting - an official from The Villages was on hand to do the honors, surrounded by Adrianne & Fred and Wendy Laval, Manager of The Villages store, and members of the Evelyn & Arthur team (more on Wendy later in this post!). Over 250 residents of The Villages shopped throughout the day, and sipped on bubbly and special 30th Anniversary Evelyn & Arthur cookies. Our newest store has the distinctive "Evelyn & Arthur" look - soft gray walls, painted mirrors and eclectic furniture, plus a little flare that fits into the Brownwood Paddock Square theme. The store features our private label E & A Collection, Bella Colori, Lisette & Sympli, along with accessories and gifts. We didn't wind up in the Villages by accident. Our manager, Wendy has years of experience in retail - in fact she formerly served as the manager in our Stuart store. A few years ago, Wendy decided to retire to The Villages - and she quickly discovered that Evelyn & Arthur would be perfect there. She's now come out of retirement to serve as manager. We are thrilled to now be part of The Villages community. The Villages has Florida charm and an exciting future. We are excited to open our doors and share our merchandise with the women in the community; we look forward to becoming an active part of this growing community.